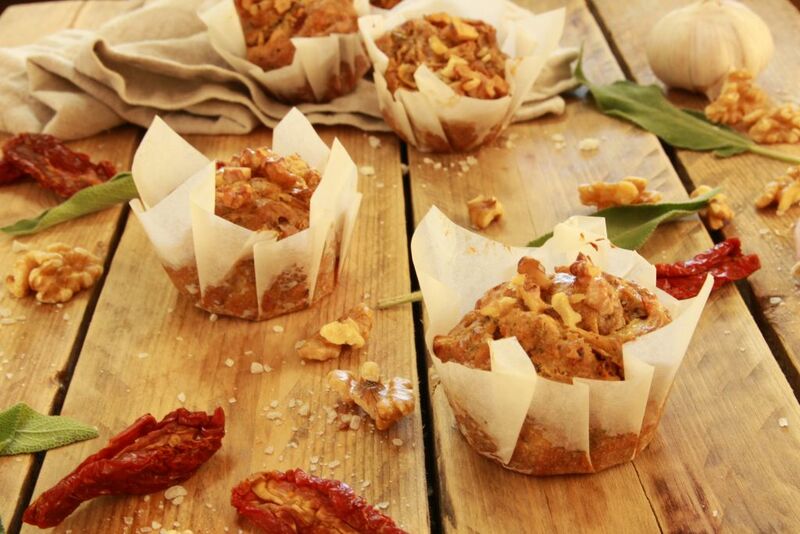 Savory Muffins With Sage And Sun-Dried Tomatoes! So, I have simon and garfunkel playing in the background, I’m doing my little dance, getting into my baking mood, and in a matter of minutes, like a puzzle, it all starts falling into place. 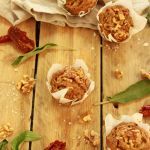 I open the fridge, decide what to take out, then before I know it, I’m whipping up a batch of these savory muffins, and as I’m about to pipe them (scoop the batter), I realize I’m out of cupcake liners! Frustrated that this happened, I quickly remembered all the gorgeous cafe looking cupcake liners, made of baking paper. I had a look at an easy DIY tutorial, made myself 6, and popped the muffins into the oven. Place the ground flax seed and water into a bowl, mix, and set aside. Peel, wash, and slice the onion in half, and then into long thin even strips. Heat a saucepan, on low heat, add the olive oil, and place the onions into the pan, then occasionally toss, until they start to caramelize. In the meantime, dice the red chili, crush the garlic cloves, and finely slice the sun-dried tomatoes and the sage leaves. When the onions are ready, take the pan off the heat, add them, and give it all a good mix. Add the coconut cream, and almond butter into the flax seed mixture, mix, then add the onion mixture. In a separate bowl, mix together the baking powder and whole spelt flour, then add it to the batter. Add a pinch of sea salt and black pepper to taste, note that the sun-dried tomatoes are also salty so don’t add too much salt, and mix well, until combined. Pipe, or scoop your batter into a muffin tray, lined with cupcake liners, and pop the tray into the oven to bake, until a toothpick comes out almost clean, around 15 – 25 minutes. They should be light golden brown, but still soft, and slightly wet inside. 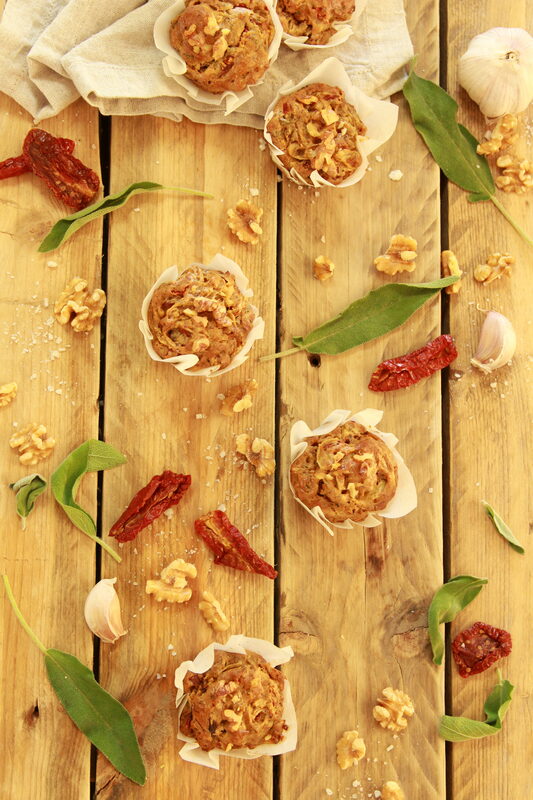 When they’re ready, take them out to slightly cool, and your savory muffins are ready to serve. If you want to freeze them, wait for them to completely cool down, then transfer them into an airtight container, and place them into the freezer. When you want to eat them, either pop them into the microwave, or oven, for a few minutes, and they will be as good as new! 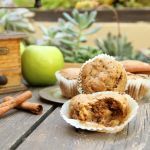 If you’re in a muffin mood, and want to indulge in something sweet, then try my Apple Cinnamon Muffins! 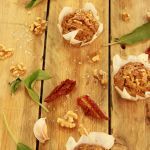 I love Savoury muffins!! And the photos, and colours are very professional!